Dari sekian banyak fitur webmin tentu yang di pakai sesuai kebutuhan saja sob, Contoh para penjual SSH dan VPN hanya memfaatkan fitur User and Group saja untuk manage user. sedangkan untuk kebutuhan share hosting perlu mengetahui fitur lain seperti , Apache webserver, MySql Database Server, Bind DNS Server, Fitur FTP seperti Pro-FTP, WU-FTP Server, Upload dan Download, Firewall, dan File manager. 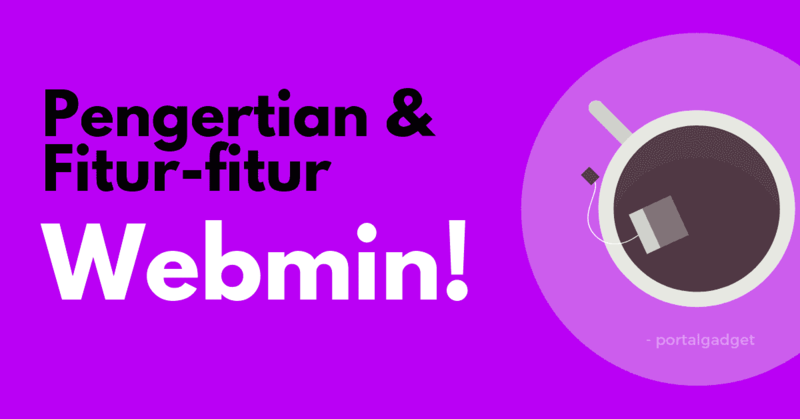 Untuk Mengenal Fitur Webmin lebih dalam lagi di perlukan percobaan-percobaan dan explorasi fitur secara langsung (praktik langsung). Set up a PPP client with the RP-PPPoE package. Configure almost all Apache directives and features. Create and edit domains and DNS records. Create and edit domains, DNS records, BIND options and views. Configure a BSD firewall using IPFW, by creating and editing rules. Perform manual or scheduled backups and restores of configuration files managed by Webmin modules. Configure Bacula to perform backups and restores manually or on schedule, for one or many systems. View reports on bandwidth usage by host, port, protocol and time on a Linux system. Setup scripts to be run at boot time from /etc/init.d or /etc/rc.local. Burn data CDs from ISO images or selected directories. Setup a remotely-accessible CVS server, manage users and browse the repository. Allows the current Webmin user to change his language, theme and possibly password. Change the password of any user on the system. Change passwords on multiple systems in a Webmin cluster at once. Schedule the transfer of files from this server to multiple servers in a Webmin cluster. Create scheduled Cron jobs that run on multiple servers simultaneously. Run commands on multiple servers at once. Install RPMs, debian and solaris packages across multiple servers from one source. Install and manage modules and themes across multiple Usermin servers. Create, update and delete users and groups across multiple servers. Unlike NIS, each server has its own passwd and group files which are remotely updated by this module. Install and manage modules, themes, users, groups and access control settings across multiple Webmin servers. Execute shell commands and view their output. Configure the CFengine program, for checking and maintaining various system-administration settings. Create buttons to execute commonly used commands or edit files on your system. Manage shared networks, subnets, hosts and groups for ISC DHCPD. Setup and edit user or group disk quotas for local filesystems. Mount filesystems and swap files usually configured in /etc/fstab or /etc/vfstab. Configure the Dovecot IMAP and POP3 mail retrieval server. Edit servers handled by Xinetd, a replacement for inetd. Configure the popular fetchmail program for automatically retrieving mail from other servers. View, edit and change permissions on files and directories on your system with a Windows-like file manager. Backup and restore filesystems using the dump and restore family of commands. Create rules to filter and forward incoming email. Configure Frox, a transparent proxy for FTP clients. Configure the Linux GRUB boot loader to allow the selection of various operating systems and kernels at boot time. Connect to another HTTP server via a tunnel through the Webmin server. Configure the Heartbeat package for automatic server failover in a cluster. Configure a firewall using the IPFilter package, by creating and editing rules. Set up a client or server for an IPsec VPN using FreeSWAN. Configure low-level services to be run at boot time, and select the initial runlevel. Edit services in /etc/inetd.conf, /etc/services and /etc/rpc. Configure the multi-protocol Jabber messaging server. Configure the Kerberos 5 client on your system. Configure your system as an LDAP client for users and groups. Manage users and groups stored in an LDAP database, used for Unix, Samba and Cyrus IMAP authentication. Edit kernels and partitions selectable at boot time with LILO. Configure a Linux firewall using iptables. Allows the editing of all tables, chains, rules and options. Create RAID 0, 1, 4, 5 and linear devices on a Linux system. Set up the automatic rotation of Apache, Squid, Syslog and other log files. Configure volume groups, physical volumes and logical volumes for Linux LVM. Setup MON, a powerful service monitor and alerting system. Setup databases, tables and permissions in your MySQL database server. Edit file shares from the FreeBSD /etc/exports file. Edit file shares as defined in the HPUX /etc/exports file. Edit NFS file shares defined in /etc/exports. Edit file shares as defined in the /etc/dfs/dfstab file. Setup a system as an NIS client, master or slave server. Note that NIS+ is not supported. Configure boot time and active interfaces, DNS, routing and /etc/hosts. Configure the service location protocol server. Configure the PAM authentication steps used by services such as telnet, POP and FTP. Configure PHP settings for the whole system or invidivual Apache virtual servers. Set up a dialin server using mgetty and PPP. Configure and establish connections to a VPN server using the PPTP protocol. Set up your system as a PPTP server so that Linux or Windows VPN clients can connect. Create and edit paritions on local SCSI and IDE disks on Linux. Create and edit paritions on local disks on Solaris. Install new Perl modules on your system, and view those already installed. Configure the Postfix mail server. Manage databases, tables and users in your PostgreSQL database server. Create and edit local and remote printers. Supports Windows print servers and Ghostscript print drivers. Configure the powerful ProFTPD FTP server. Supports all options in most of the standard modules. Edit recipes in the global /etc/procmailrc file, which apply to all incoming email. Create .htaccess and htpasswd files to protect web-acessible directories. Configure the QMail mail server, a simpler alternative to Sendmail. Manage RBAC user attributes, profiles and authorizations. Read email in users’ mailboxes. List, kill and renice running processes on your system. Check the status of IDE drives to detect problems and potential failures. Setup the SSH server for remote secure logins. Login to your system with telnet or SSH. Setup SSL tunnels to encrypt services like POP3 and IMAP, using stunnel run from inetd. Create and edit samba file and print shares. Schedule the execution of one-off commands or scripts. Create, edit and delete Cron jobs. Configure the portsentry, hostsentry and logcheck system security monitoring programs. Manage sendmail aliases, masquerading, address rewriting and other features. Manage software packages on your system, and install new packages. Create and manage Solaris 10 zones. Set up and configure SpamAssassin to filter email received by your system. Configure and schedule SARG, a tool for generating reports from Squid access logs. Configure Squid options, ACLs, caching parameters and proxy users. View man pages, HOWTOs and other package documentation. Configure the syslog server on your system and view its log files. Configure the Syslog-NG server on your system and view its log files. Set the sytem and hardware time either manually or from a time server. View the status of services on your system and on remote systems. Upload multiple files to the server, and download multiple URLs either immediately or in the background at a scheduled time. Configure global options for the Usermin user account management server. Create and edit Unix users and groups from the /etc/passwd and /etc/group files. Configure the access control, anonymous FTP and other options of WU-FTPd. View detailed logs of actions by Webmin users. Configure Webmin itself, such as allowed hosts, SSL, installed modules and themes. Create Webmin users and configure which modules and features they are allowed to access. Manage the NFS ID mapping daemon. Hati-hati Kejahatan Cyber Dengan Teknik Social Engineering. Pengertian Komputer Dan Fungsi Komputer (LENGKAP). Apa Yang Dimaksud Dengan Bandwidth,Troughput dan Latency ?